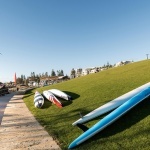 非常感谢 Taylor Cullity Lethlean 和 UDLA 将项目介绍和项目图片授权gooood发行。更多关于他们请至：Taylor Cullity Lethlean on gooood. 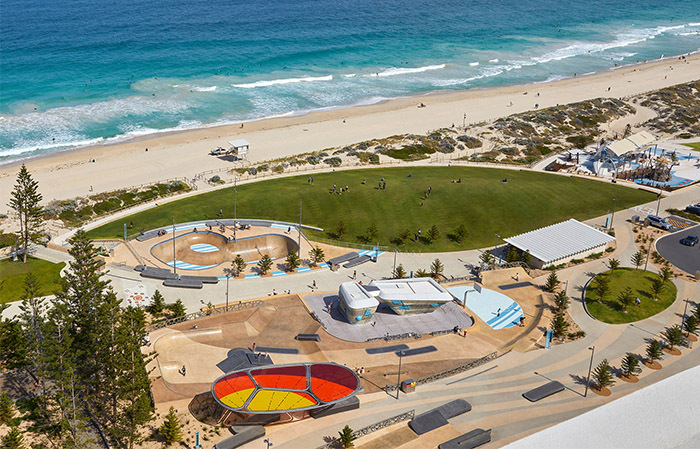 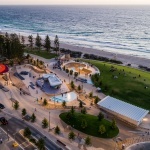 Perth’s famous Scarborough Beach has been remade into one of Australia’s best urban beach precincts. 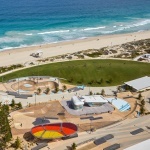 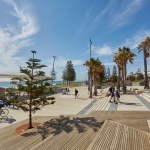 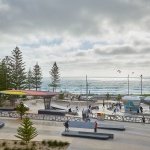 Delivered by the Metropolitan Redevelopment Authority in partnership with the City of Stirling and Designed by a TCL and UDLA-led consortium, the project transformed a previously disconnected and carpark-dominated beachfront into a lively, pedestrian-focused precinct that celebrates health and wellness. 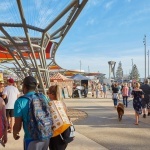 The design for the foreshore introduced two main pedestrian promenades that provide improved circulation and frame new amenities and recreational opportunities. 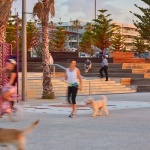 The upper promenade connects to retail and food and beverage outlets, civic plazas and new development zones, while the lower promenade provides opportunities for jogging, cycling and other active uses. 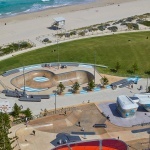 Central to the project is a world-class skate and bouldering space called ‘The Snake Pit,’ de-signed in collaboration with Enlocus, which includes a 3.6-meter, competition-grade skate bowl for local use, events and global competitions. 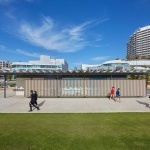 ‘Scarborough Square’ is a new civic space that sits between the beach and The Esplanade. 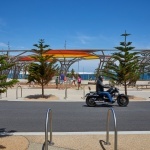 The square is the main arrival to the foreshore and includes a set of iconic shade arbors designed by Taylor Robinson Chaney Broderick. 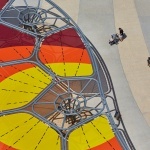 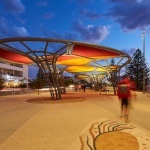 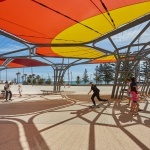 The arbors were inspired by the ‘voronoi’ structure found in natural systems and geometries and were developed in collaboration with Aboriginal artist Sharyn Egan. 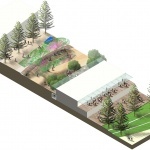 In the north of the site a new landform has been created using excavated soil from the site. 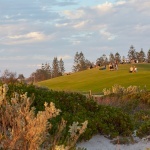 Named Sunset Hill, it allows spectacular views over the Indian Ocean as well as up and down the beach. 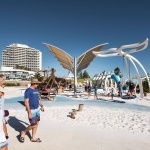 To the north a new children’s playground has been designed around a whale skeleton, interpret-ing Indigenous Whadjuk/Noongar Dreaming stories of spirits returning to land through the whales. 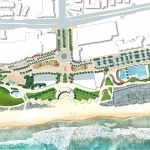 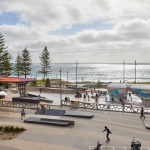 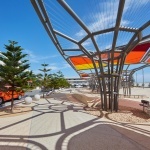 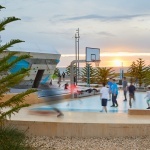 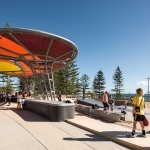 The redeveloped Scarborough Foreshore has strengthened Perth’s beach-side image by offering an inclusive and celebratory public realm where visitors and the local community can come to-gether and enjoy the city’s beautiful seaside location. 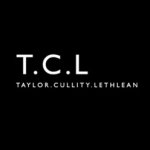 More: Taylor Cullity Lethlean + UDLA 更多关于他们请至：Taylor Cullity Lethlean on gooood.